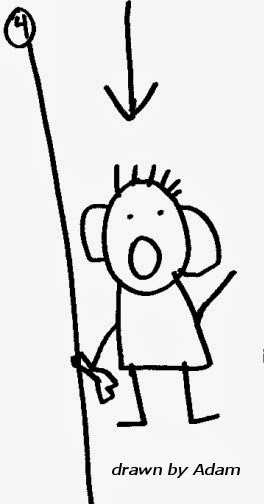 Autism and the Art of Communication: Help! I've fallen and I can't get up! "Falling down is part of life, getting back up is living. Translated to traditional language, I guess it would be: "What will the man do now that his hat has fallen off his head and over a cliff?" (a classic cartoon set-up). Does the man value the hat? Will he take a risk to retrieve it? or will he turn his back, curse his luck and buy another? 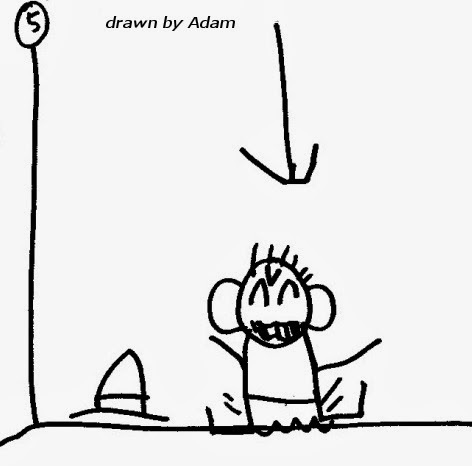 In Adam's visual "answer", the man decides to take a risk and go after his hat. Did he slip while reaching? Did he not think it through and just jump? I don't know, but he does seem a bit surprised by the outcome. As luck would have it, he manages to grab the small stick protruding from the cliff. Whew! Sometimes in life, a bit of luck and quick reflexes allow us to save ourselves from rash choices or bad circumstances. I love how pleased (and unsurprised) the little guy is with this turn of events. 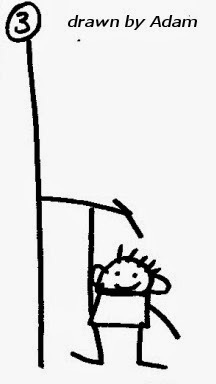 But of course, this is life and one fall can often be followed by another (especially when the author of your life story has a sense of humour like Adam's). 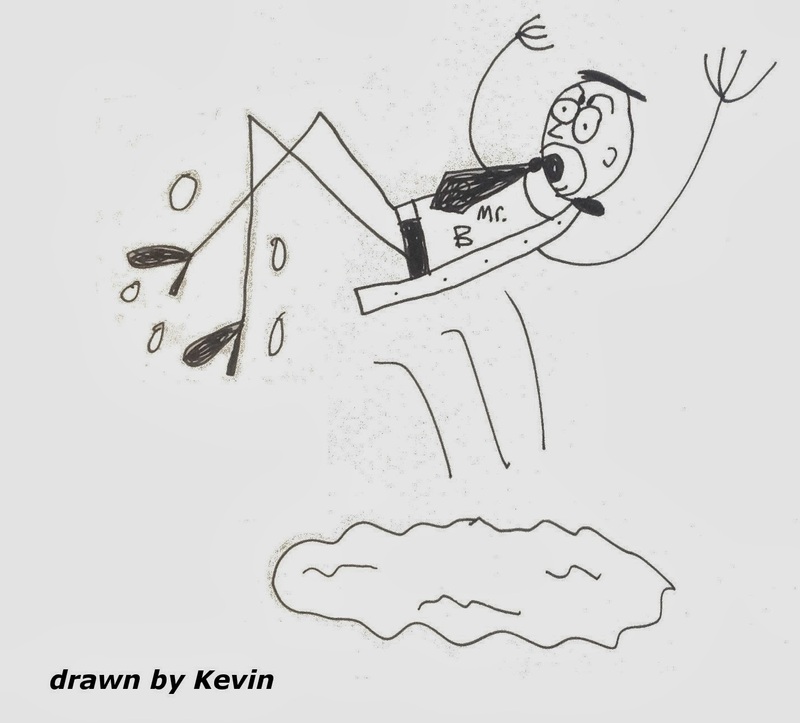 The stick breaks and the little person is once again plummeting down the side of the cliff, wearing another expression of surprise at the hand life has dealt him. And sooner or later, in real life or cartoon life, we have to hit bottom. Going by the man's face, this was a hard landing (one that would have you sitting on a donut pillow for at least a week or so). We all fall down. Sometimes we fall multiple times without rising in-between - we can fall far and hit bottom very hard. We get the wind knocked out of us figuratively and literally. We may say to ourselves "I don't know how to recover from this one, it's too big, it's too hard, it's one too many, I can't get up". So we lay there for a while ... but then what? 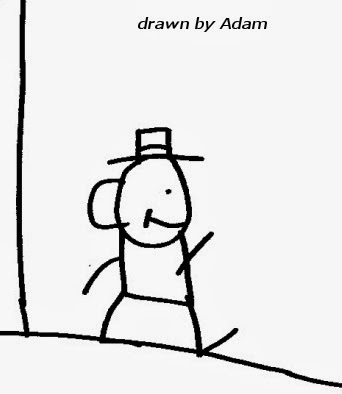 In Adam's story, the man simply takes a breath, retrieves his hat (which he had the good luck to fall beside, rather than on), dusts it off, puts it on his head, stands up and walks on. 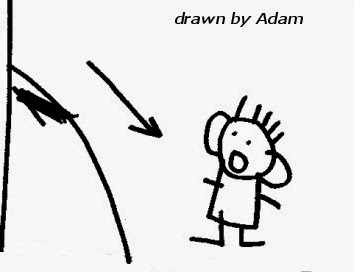 The drawn end of this story is very interesting to me in light of who Adam has revealed himself to be over the past 13 years since he drew this story. He is a person who faces many challenges every day, including communication disconnects, sensory overload, debilitating allergies and medical conditions ( click here for a piece of the medical back story ). I have seen him laid low time and again, and time and again I have seen him stand up, pick up his figurative hat, and walk forward. He doesn't get angry, he doesn't do "poor me", he just gets up and goes on. When you've fallen and you don't think you can get up, consider your alternatives: staying where you are is not usually a good one, and if you're as low as you can go almost any choice or action could potentially put you in a better spot. So take action. Do something. 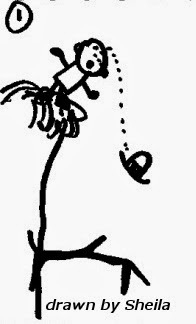 It's a strategy I use when I clean up a particularly large mess (I hate housework): if I think about it too hard, I'm frozen into inaction ("this mess is too big", "no one could clean this up", "we just have to move"). So instead, I go "round and round" doing something: "this coat doesn't belong in the sink, I'll hang it up", "no one needs 4 hockey sticks in the living room, so I'll put 3 in the garage", "why is there a live turtle in the dining room? don't think, just put it back in the pond" (I have 3 boys and a small house, we have had some memorable messes). As each bit of mess goes away, the overall picture changes and new ideas and solutions present themselves ("oh look, the broom was buried under the dirty laundry! the perfect tool for sweeping the baking soda & vinegar science project volcano eruption off the ceiling!"). Before you know it, you step back and realize that this problem might be fixable after all. When you fall down, don't just lie there .. do something. Take one small step and then another. No matter the problems or circumstances, action feels better than inaction, and each action plants seeds that can change things for the better.